“Tokyo Buddha” , one of the three major Japanese Buddha statues, and unique stone statues. Great Buddha of Nara, located in Todai Temple, Nara prefecture, and Great Buddha of Kamakura, located in Kotoku-in, Kanagawa prefecture are the most well known Buddha. 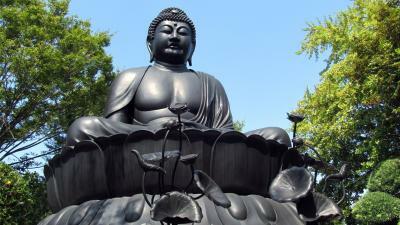 But did you know that there is also a Great Buddha known as one of the three main Buddha of Japan, located in metropolitan Tokyo? Let’s go see the “Great Buddha of Tokyo”, located in Joren Temple, in Itabashi-ward, Tokyo. Great Buddha of Tokyo, located in Joren Temple, built around year 1400, is made of bonze, and is the third largest Great Buddha, after that of Nara, and Kamakura. It is 13m high with 8m statue height, 3m size head, and weighs 32 tons. In 1971, after spending 7 years relocating the Joren Temple to the current location of former Akatsukajo Ninomaru, this Buddha was built for memorial service of those killed in natural disaster or war with no living relatives, and enduring peace. At Joren Temple, there are various stone statues in addition to the Great Buddha of Tokyo, which includes the Seven Deities of Good Luck, Fukuju Kannon of Fukuju Kannon-do Hall, and many others placed in the precincts of the temple. One in particular that catches your eyes is the “Ogre that endures everything”. Its unique feature even looks somewhat adorable. Also, there are statues of “Datsueba”, a wizard in the Sanzu-no-kawa River to plunder clothes of the dead, and “En-no-Ozuno”, a holy man from the Asuka to Nara period. It is interesting to see these unique stone statues together with the Great Buddha of Tokyo. After visiting Joren Temple, there are many more tourism spots recommended for visit around the temple. One of the spots you don’t want to miss is the botanical garden ”Itabashi-ward Akatsuka Botanical Garden”, located on the hillside. The garden itself is compact, however has many varieties of trees planted functioning as a tree exhibition park, with delicate flowers blooming on the ground. It also has a section with collection of flowers and plants read in the Manyo-shu, the oldest anthology of tanka. The “Waterfall of Akatsukafudo” with its profound atmosphere, “Itabashi-ward Local Collection Museum” with collection of fossils, earthenware, and ancient documents, “Itabashi-ward Museum” with exhibition of picture books are also some of the recommended places for visit. If you are looking for places to eat, you can stop by at “Daibutsu Soba (Buddha Noodle)” located across from the Temple. After visiting one of the three major Great Buddha of Japan, stroll around the neighborhood before heading back.